E-learning course and 10-minute walkthrough for manufacturers needing barcodes (2008). 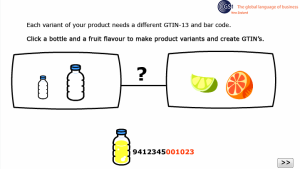 Course created for GS1 New Zealand, and reused by other national GS1 units (UK, global). Instructional design, graphic design, storyboarding. Development in Captivate 3 and Flash.